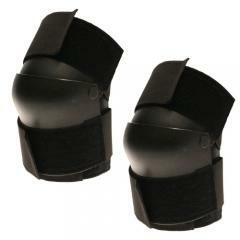 Protect knees from crippling injuries by wearing the 1010-ET Knee Shield Knee Pad from Paulson. Knees are one of the most critical joints in the body and a direct impact can send even the strongest officer to the ground or even the hospital. The riot-ready pads offer the protection needed to prevent injury in chaotic, hostile environments. Each shield is constructed from an ultra-tough polymer plastic that blocks penetration and deflects damage from blows. The articulated outer casing covers the knee to offer total protection while retaining full mobility. Designed for versatile wear, the pads are secured by elastic straps with Velcro fasteners. The Velcro can be worn loosely for comfortable travel and tightened at a moment's notice when entering a conflict.